“Lor-love-a-duck, it’s the missus!” exclaims an astonished ‘30s character caught off guard in a pub. The utterance came as quickly to the tongues of my Scottish grandparents as “skin a rabbit” and a few other choice references to local fauna during dark days. Or so my memory says. I just had a love-a-duck moment myself during a quest for local cooking oil. 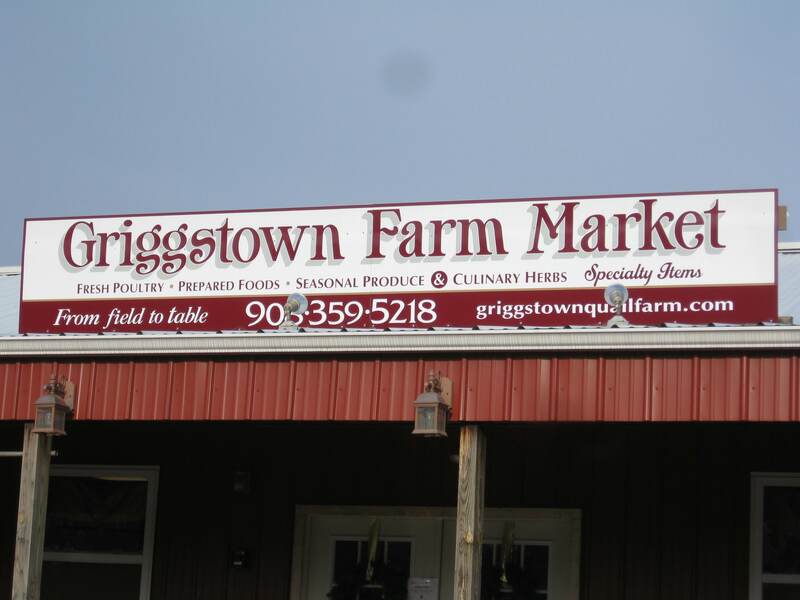 Nearby Griggstown Quail Farm responsibly raises an astonishing variety of birds for the market: quail, pheasant, duck, goose, turkey, chicken, poussin, and others. Ah ha, flavorful duck fat could be the answer. I went to the farm stand asking for a whole duck and was presented with a giant Muscovy mallard and a couple of thankfully smaller hens, frozen but not yet marked with a label for sale. Thawed, my 4-pound duck hen presented lots of possibilities and my waste-not-want-not frugality prevailed to “use the whole thing.” So here, in Part 1 of this adventure, I de-boned and partially skinned the duck, creating two leg/thigh sections with the oyster attached (for Part 1), and two cleanly filleted breasts (for Part 2 coming soon). Then I took the carcass and divided it into (1) skin and fat, and (2) bones. Altogether, I made: rendered duck fat, duck broth, duck confit from the legs and rillettes (a type of pâté) for this post, and roasted duck breasts for the next post. The skin and fat globules were rendered to produce flavorful duck fat that I will use instead of non-local vegetable oil for sautéing roots and cabbages. This will last for a long time. The remaining cracklings could be sprinkled as croutons or just munched on as a snack. The bones and neck were reduced into duck stock flavored with local organic onions and carrots, and Asian celery from my garden. Future duck soup? Cassoulet? 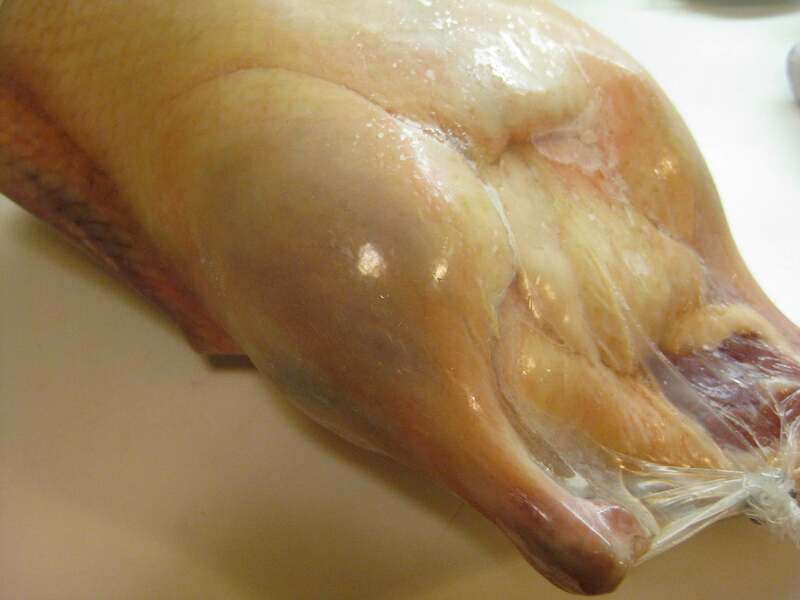 If eating the legs as confit, I would have removed the cover for the last of the 3-hour cooking time. 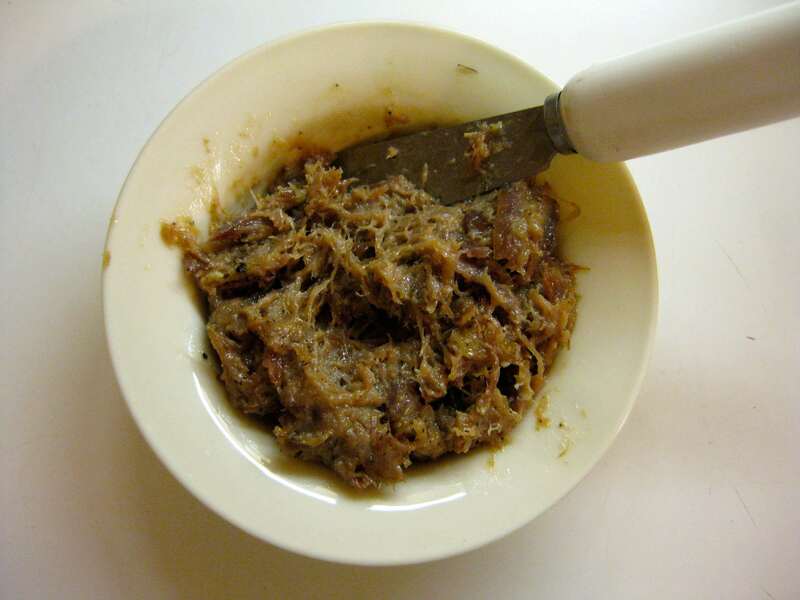 Instead, I made rillettes, a pâté-like spread of shredded meat packed in a little crock, and didn’t need the outside to be crispy. The word rillettes is interesting in that its deeper root, beyond its association with pork belly, comes from words associated with boards or lath. That makes sense because they’re formed from strands of meat that are peeled along the grain, as you would see in a stalk of celery or a branch of wood. I served the rillettes for a dark days appetizer alongside an array of spicy pickled cherries and grapes that I made last summer and stored in my pantry. To be fully local I would have had to serve the rillettes on chips of roasted potatoes but instead I went for locally made bread. Searching for local grains to make my own bread and crackers is an adventure for another day. 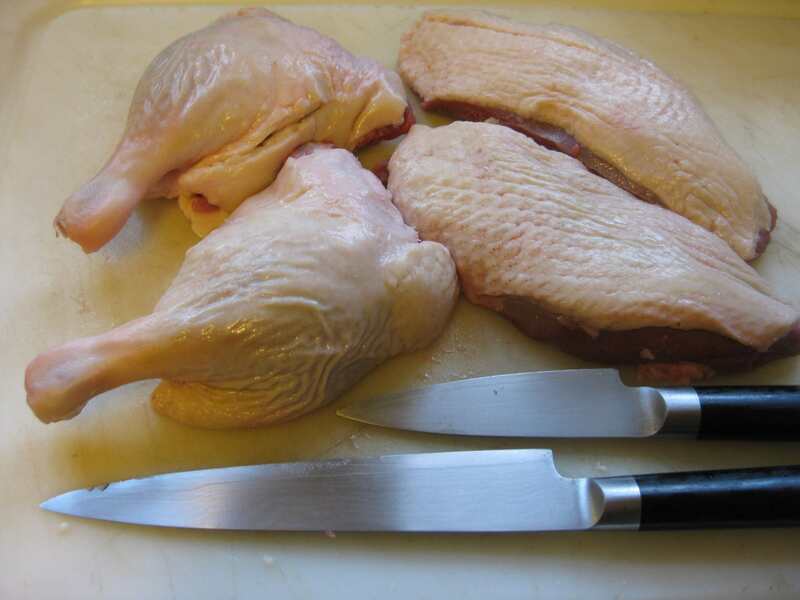 Cut the duck skin into pieces, 1” or less, and place them in a deep saucepan. Add a small amount of water, coming less than halfway up the volume of skin. (I added about 1/3 c of water to the skin of an entire duck except for what was still attached to the legs and breasts that I was cooking separately. The purpose is to help start the rendering process and keep it gentle. The water will eventually evaporate.) Cook over medium low heat and do not let the mixture boil. It will cook for approximately an hour before the water is evaporated and the skin crisps to cracklings. Strain the liquid, being careful not to incorporate any browned bits. The liquid should be clear. Store it in a jar in the refrigerator. It will turn white and will be soft enough to spoon. Coat the meat with the salt, pepper and thyme and place it on top of pieces of bay leaf in a shallow glass or ceramic dish. Cover tightly and refrigerate overnight. Preheat the oven to 325 degrees. 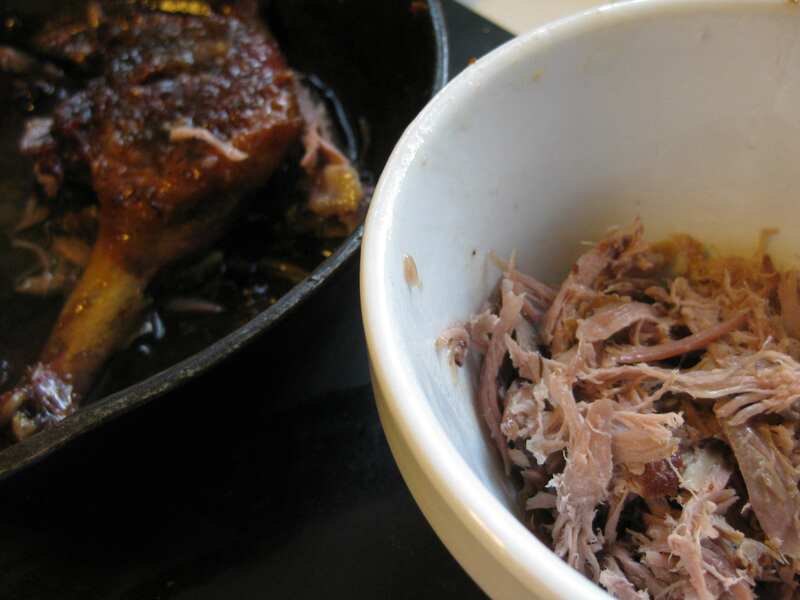 Place the duck pieces skin side down in a small, heavy skillet cast iron that will hold the duck rather snugly. Cook on the stove over medium-low heat for about 20 minutes or until the fat has rendered about ¼ inch deep in the pan. Turn the duck over and let the bottom (meaty side) sear. 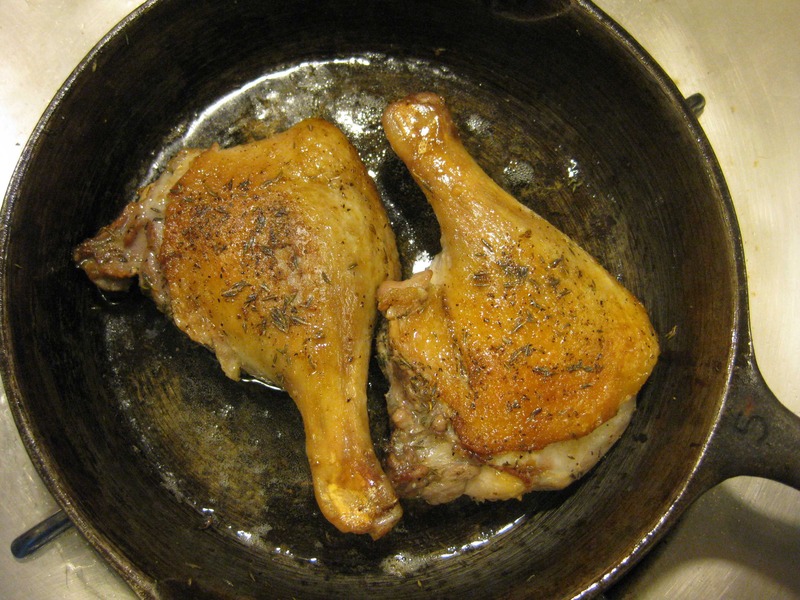 Cover the skillet with two layers of aluminum foil, being careful to keep it above the surface of the duck. Place the skillet in the oven and turn the heat down to 275 degrees. Cook for two hours and if using the duck for confit, remove the foil and cook for another hour until the surface is dark and crispy. If using for rillettes, leave the foil on to keep the meat soft. After cooking the duck legs for confit, let them cool to room temperature. Remove the skin and carefully shred the meat along the grain into strands. Add a little of the duck fat to moisten and season with salt and pepper. This can be served just as it is. Alternatively, you can season it with herbs such as thyme or a mixture called quatre epices (four spices) made of a pinch each of nutmeg, cloves, pepper and either cinnamon or ginger. Some people add a few drops of cognac. Serve as a spread with small pieces of sliced baguette or crackers. 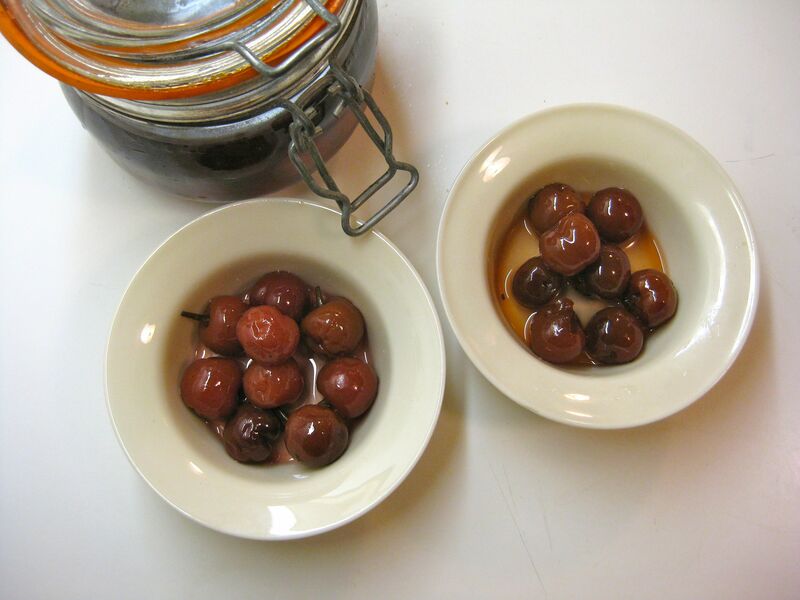 Some spicy fruit such as picked cherries or grapes is an especially good accompaniment. We had two duck this past weekend and I’m left with two legs. I’ve been debating on roasting them or making confit ravioli. I think the confit choice is winning.